Cats Pokie Review - Play today! 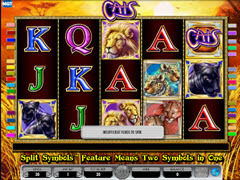 Initially you may think that Cats 5 reel, 30 line pokie is nothing more than another African safari, and that all you’re embarking on is a game drive, but this Feline driven game offers wilds that enable winning combinations making it more enticing. Another great feature is that the game boasts the Split symbol feature. The graphics on the symbols are majestic and offer up to 10 matching cats. Represented by paw prints this game offers free spins, making it even more lucrative and intriguing. A mammoth top award is what makes this game hard to resist. The cats 5 reel is awe inspiring in its sharp contrast to detail. There is nothing too involved with this game, and being a 30 pokie, you can’t go wrong. The game features symbols that are enchanting and mystical at the same time. The attention to details in phenomenal. This game allows you to win handsomely but also leaves the imagination running wild as all the symbols roll around and make you nostalgic. The symbols boast the roaming mountain lion, mighty lion is all his splendour, the fearsome tiger, captivating black panther and the steadfast Cheetah, in explicit detail. The game also boasts High Deck cards in illuminating colours. No you are not seeing double, this game has the split symbol, which reveals multiple Cats appearing and increasing your chance of bigger payouts. 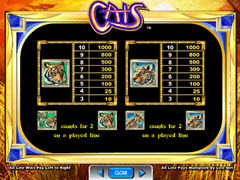 The wilds come to you with the Cats game logo in purple, these wilds will be able to complete any combinations by taking the value of any other symbol appearing on the same payline, the wild Cats symbol will however not be able to complete any combinations for the paw print scatters to activate any features. The scatters are held by the white paw print on a ruby stone, the scatter can be split, which means up to 2 of them can appear in the same symbol, giving you the opportunity of getting up to 6 scatters on a single payline. The scatter will only be shown on reel 2 to 4. The free spin feature will be activated when at least 5 of the paw print scatters are displayed, keep in mind the scatter can appear as a split symbol. Once the feature has been triggered you will receive up to 10 free spins. Playing this 5 reel, 30 pokie is very simple and rewarding. With a variety of symbols you are guaranteed not to feel repetitive, but rather wrapped up in the magic and mystery that this game offers. This game is perfect for those of you who seek adventure all the while your winnings are adding up quietly in the background. So sit back, relax and enjoy the journey.